I couldn’t print from my trusty old LaserJet M1217 nfw MFP printer this morning. And when I rebooted it, the printer display showed “Initializing…” and then appeared to shut down and reboot again. It went on like this for a few times until it became obvious that there was something wrong. So as usual, I asked Miss Google (most people call her Mister for reasons I do now know) for the answer. I found several different solutions, but only one worked for me so I’m posting the instructions below. Note: This solution may also apply to other LaserJet models. 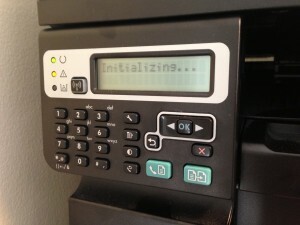 So you’re having the same issue (your LaserJet printer is stuck at “Initializing...“), you might want to try this fix. Turn off the LaserJet M1217 nfw MFP printer. Press and hold the red X button (cancel) and copy button (below the red x button) at the same time. Turn on the LaserJet M1217 nfw MFP printer. Continue to hold the two buttons until you see the printer display show PERMANENT STORAGE INIT. Release the two buttons. The printer continues to boot up. When the bootup process is complete, the printer display shows Ready. You should now be able to print from your LaserJet printer again. Did it work for you? Let us know by leaving a comment below. Same problem after trying this several times. It works perfectly, thanks a lot ! My LaserJet M1217 new MFP would quickly flash initializing then show “Genuine HP Installed” then after 30-45 seconds quickly flash “”Initializing” then go back to “Genuine HP Installed” over and over again. Restarting the printer did nothing but restarting by pressing the red “X” and copy button fixed the problem – Thank you very much for posting your resolution!!! thank you. worked great. Had spent a lot of time trying to resolve this issue until I found you. Many thanks. Thanks was very helpful. It worked as noted.